Following a nine-month $140 million renovation, Mandarin Oriental reopened at end of September 2006. Originally opened in 1963, Mandarin Oriental is one of the most luxuries hotels in Hong Kong. It is within walking distance to Star Ferry, the Landmark and the IFC Malls. Apart from its world famous SPA and fine dining services, the Hong Kong Mandarin Barber shop is one of the most popular barber shops in town. Why? I had never used their services. But my boss, my former bosses and most of the businessmen I know use their service. HK$350 for a hair cut is quite expensive, but they are always fully booked. For male guests who want a grooming, please make sure to make a booking in advance. Walk in service is not guaranteed. Note: Mandarin has a boutique hotel called Landmark Oriental which is just a few blocks away. 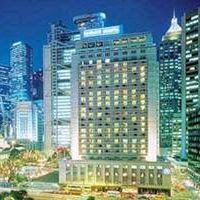 If you want to go for a truly 5-star luxury hotel, make sure to book the Mandarin Oriental at 5 Connaught Road Central.